Ah the first week in Bologna. I had a lot of things to do. First, I knew that there were no sheets for the bed in my apartment so I had arranged ahead of time to borrow a set from Cesarina. So for that reason and the fact that I had left a bunch of stuff in a carrello in the garage. For the last 4 or 5 years I’ve always left some stuff there but since I knew that I would be back for a LONG stay (years) then I left a lot more than usual. By the way my good friend Monica was nice enough to meet me at the airport and give me a ride to the house and then we had dinner together. It was really a joy to see a familiar face when I exited from the baggage area. So the first night I stayed at that house and then took a taxi the next morning with the carrello, two big suitcases, a carry-on suitcase and a computer bag to my house, well, in italian there are no separate words for house and home and any place where you live is called a “casa” even if it is an apartment. So now the first order of business (after unpacking the suitcases) was to buy some sheets for my bed and some towels. In the spring Lia (another good friend) had introduced me to a bargain household linens store that thankfully is very close to where I live so I bought two sets of sheets, 3 bath towels (small, medium and large) and a bath mat. I will have to return to get some sheets for the guest beds (they are singles, mine is a double – maybe a queen). Next I had to buy a clothes drying rack (called a “stendino”) because once I washed laundry I needed somewhere to dry it. So I went to hardware store and bought a decent one and an iron (all of my shirts were wrinkled). What fun getting this stuff home on the bus. So I ironed shirts and put them in the closet. Here they are amoires. American style closets are as rare as clothes dryer appliances. Then I decided I had better do some grocery shopping since other than cleaning products and toilet paper there was absolutely nothing in the house. Fortunately there is pretty large supermarket near me so I went there and filled up the carrello with a bunch of stuff to the tune of about 75 euros (I returned the next day for another full load about 50 euros. Now the basics are fully taken care of. 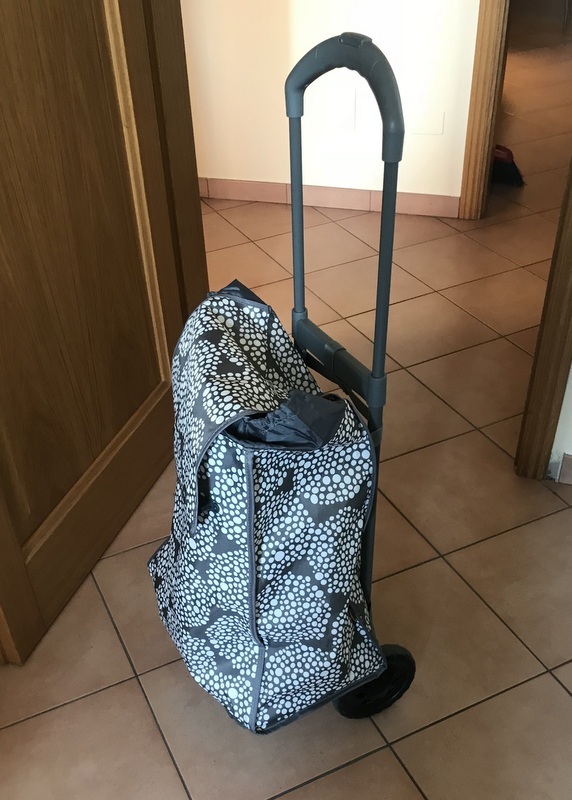 Thank God for the carrello and the elevator! By the way a euro is currently worth about $1.15. So Saturday (full day 2) I decided it’s time to wash the sheets and pillow cases so that I can return them to Cesarina. So I put them in the washer along with a towel and some of my clothes. I found the manual for the washing machine figured out the settings and turned it on and…. nothing happened. I checked the power switches on the wall in case one of them was for the washer (probable) and I also checked the circuit breakers – everything was in order. So I texted the owner’s son Leonardo who manages properties for her. He gave me the name and phone number of his trusted handyman (“tuttofare”, literally does everything) and made an appointment with Carlo for the following Tuesday. To make a long story short Carlo said that they had had trouble with this machine before and it really needed to be replaced so I hope that this happens soon. In the meantime on Monday I went to a volunteer organization (CGIL) which helps workers in various ways, but especially foreigners dealing with the notorious Italian bureaucracy. 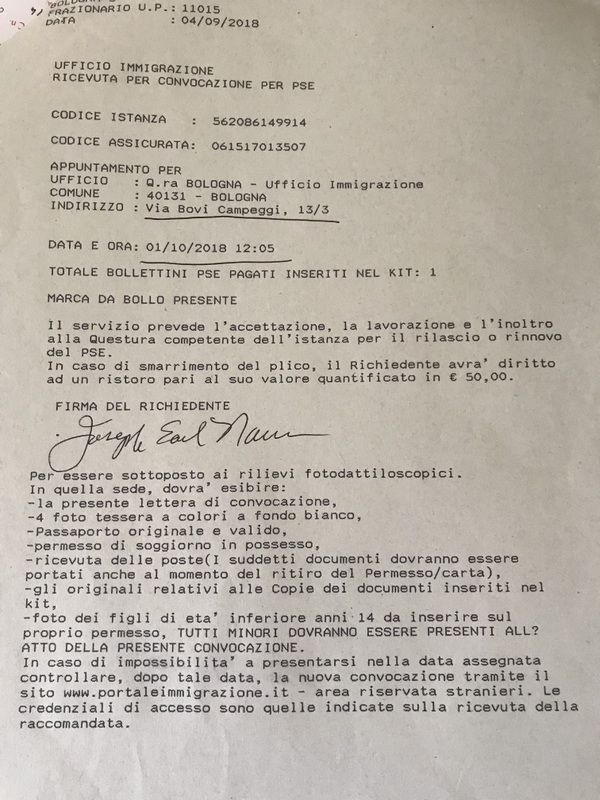 So they helped me fill out the paperwork necessary for applying for a “permesso di soggiorno” a permit to stay which MUST be applied for within 8 days of arrival in Italy. Rather a short fuse. Especially since the rules as I understand them are that you must also have a health insurance policy along with the application. I had researched the availability of such insurance extensively. I found that health insurance that covers pretty much anything at my age costs an arm and a leg. However there was a particular type of insurance which covered little but was adequate for getting the “permesso”. I had emailed an immigration attorney here to ask if this would be valid for me and her reply was positive and…WRONG. First of all it was not valid for my type of visa and second it was only issued for those under 65 years of age. I strike out on both counts. So now I was starting to have a panic attack. I returned to CGIL and they said just go ahead and go to the post office (where you submit the documents and forms for the permesso) and start the process. They give you an appointment date for the office of immigration at the police station for finger printing and whatever else and I can submit the proof of insurance at that time. That went as described and now after about 140 euros in fees of one sort of another I had passed the first major bureaucratic hurdle and had breathing space since my appointment is the 1st of October, more then 3 weeks away. Now with this receipt which serves as a “temporary” permesso I can thread my way through other bureaucratic challenges. Stay tuned for the next episode of “Stuggles with the Bureaucracy”. This entry was posted on Monday, September 10th, 2018 at 10:24 am	and is filed under Culture, Travel. You can follow any responses to this entry through the RSS 2.0 feed. You can leave a response, or trackback from your own site. I’m glad that you’re enjoying it. Sometimes when I’m writing it seems pretty boring. It certainly has been very frustrating at times but I’m kind of getting into the rhythm of Italian life. I’ll be glad when all is settled and I can just be living here with just occasional excursions into the bureaucratic morass.